Picking up where the first set left off, The Complete Star Trek the Next Generation Series 2 offers a comprehensive look at the second half of the iconic show. Every card in the base set explores a single episode that originally aired between 1991 and 1994 with a synopsis and five photos. Autographs are the chase highlight, with four coming in every box. 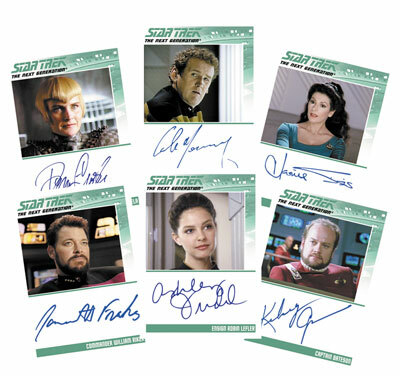 Notable signers include Ashley Judd, Kelsey Grammer, Jonathan Frakes, Marina Sirtis and Colm Meaney. Rittenhouse will also be inserting 50 Cut Signature cards of James Doohan, who played Scotty in the original series and appeared in TNG. 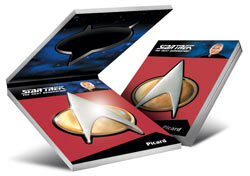 Additional inserts in The Complete Star Trek the Next Generation Series 2 include Star Trek Communicator Pin Cards, Tribute and Best of the Holodeck. Picking up where Series 1 left off, the 90-card base set covers the last 88 episodes of the series that aired between 1991 and 1994. Each base card has five photos and a show description. 50 Cut Signature cards of James Doohan (Scotty) randomly inserted. Rittenhouse is also creating an album for the series that will come with an exclusive promo card.